The Bucks LTA hosted the annual AGM on Monday 26th November. Andrew Petherick (Chair of the Bucks LTA) gave his report on the success Buckinghamshire has had over the past 12 months. A number of awards were also given out including the Meme Griffiths Award. Meme Griffiths Award 2018 The above award will be presented at the Bucks Tennis AGM on 26th November 2018 at Aylesbury College, Aylesbury. 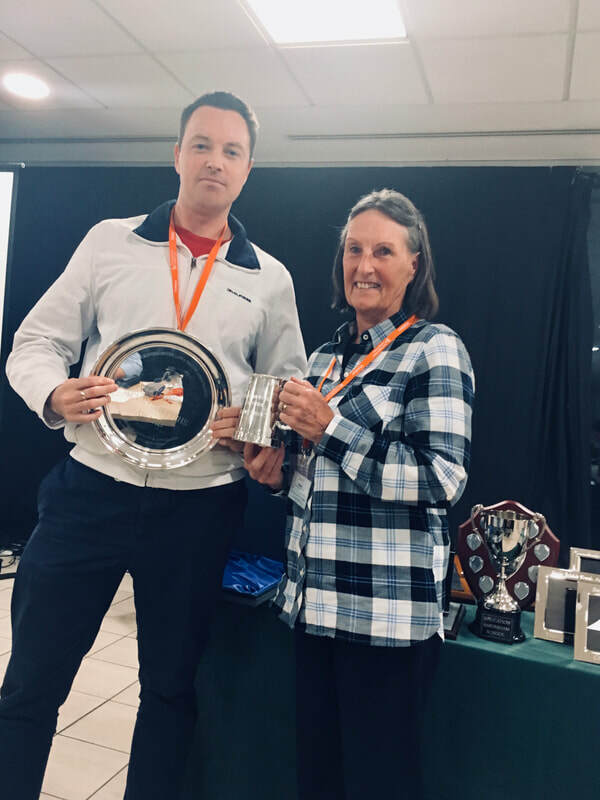 This award is presented in memory of Meme Griffiths for outstanding contribution and commitment to tennis life in the County or perhaps for real commitment to team play, work with juniors. Stephen Wright was delighted to be nominated as the 2018 recipient of the Meme Griffiths Award for his outstanding contribution to tennis in Buckinghamshire. ​The picture to the right is Head Coach, Stephen Wright, and Bucks LTA President Rosemary Badman at the Bucks AGM. Please see what one of our happy clients at Farnham Common Tennis Club has to say about our adult intermediate coaching class. Congratulations to our latest players at Farnham Common Tennis Club to be invited to attend 8/U County Training Camps at Halton High Performance Tennis Centre. Joseph Lally, Mylah Anderson and Astrid Anderson (also members at Stoke Poges Tennis Club) have all been training hard in order to improve their games. FCTC also have 3 players who have been invited to attend the County Camps for a second year: Finley Kidd, Amy Carson and Samuel Mooney. ​Congratulations also must go to Charlie Quantrill who have been invited to attend the 9/U County Training Camps at Halton. Charlie trains at Chalfont St. Peter Tennis Club. Our Summer Holiday Tennis Camps are up and running. We have run two camps already and there are another 5 tennis camps taking place in South Buckinghamshire over the Summer. The camps are held at Farnham Common, Chalfont St. Peter and Stoke Poges Tennis Club. Are your children spending their Summer holidays inside on the couch playing computer games? Would you like your child to go outside and get some exercise, make new friends, learn a new skill and have fun? Each camp runs between 10-4pm and there is a half day 10-1pm option too. Bucks LTA has offered ITC and its current links with players at Chalfont St. Peter, Stoke Poges and Farnham Common Tennis Clubs in Buckinghamshire the opportunity to be part of the prestigious Aspirantes Programme. What is the Aspirantes Programme? Aspirantes is an LTA initiative that subsidises selected players coaching programmes to enable players to train several times per week. The idea is that with increased training hours each week players will improve their game with the intention of attending County squad training sessions. A huge thank you must go to the LEAP team (Jacqueline, Shay, Sion and Andrea) who have assisted all the Sportivate providers including ITC with attracting participants from sedentary backgrounds into sports. We are looking for a coach to help us maintain and grow our coaching programme at 3 tennis clubs and several schools in Buckinghamshire This position would be ideal for a coach who would like to further their career by taking on increased hours and responsibilities. The successful candidate will help run an effective and successful coaching programme. We also offer a very competitive payment structure. We are looking for a coach to assist the coaching team with a wide range of coaching services including mini tennis, junior, adult beginner/intermediate classes, school work, tournaments and holiday camps. There will also be individual lessons available to coach as well. The coach will be self-employed. This position would suit an experienced level 2 or preferably a level 3 coach. It is essential that the applicant has a car as we do work at 3 clubs and several schools in the area. The successful candidate will also have a valid first aid certificate, DBS, public liability insurance and a valid coaching licence. The Tennis Clubs requiring assistance are: Farnham Common, Chalfont St. Peter and Stoke Poges Tennis Clubs which are situated in South Buckinghamshire. All 3 tennis clubs have floodlights which enable year-round coaching. Farnham Common Tennis Club has 6 macadam courts and is part of Farnham Common Sports Club which has the following sports sections (cricket, squash, rugby and hockey). The club also has a licensed bar, a pool table, changing rooms and a wide range of fitness classes on offer in the activities room. The activities room can be used over the winter to coach mini tennis when it is too wet/cold to play outside at Farnham Common. Chalfont St. Peter Tennis Club has 4 newly resurfaced Tiger Turf Courts (3 with floodlights). Stoke Poges Tennis Club has 3 Tiger Turf Courts (2 with floodlights). The clubs combined memberships are around 400 tennis members. We have links with 7 primary schools, and 2 secondary schools. The mission is to grow each clubs’ respective coaching programmes and memberships by offering high quality coaching services. We also have very close links with our local Sports Partnership LEAP. Are you looking for an exciting new coaching post? Our set up could be the answer for you! The ideal candidate for this position will be someone who has passion and dedication to offering a first-class service. While a few years of experience coaching are useful for this position it is not essential as we can mentor the right candidate. We also have a small amount of funding available to assist with further qualifications if the successful candidate would like to continue moving up the LTA qualification rankings. The start date for this position is 16/04/18. Applications should include a one page cover letter and CV which can be sent to: s.wright@internationaltenniscoaching.com. Shortlisted applicants will be invited to attend an interview which will take place w/c 2nd April. A decision will be made on the successful applicant on the 9th April. Farnham Common Tennis Club has a third player invited to attend county training sessions within a 2 month period. Amy Carson joins Finley Kidd and Samuel Mooney who have been invited to train with Buckinghamshire County's 8/U players. Well done Amy! We wish all 39 players competing the best of luck. The most important thing to remember is to enjoy the competition! Congratulations to Samuel Mooney who has been invited to join in with Buckinghamshire's 8/U County team training sessions. Samuel plays at Farnham Common Tennis Club and is the second player in the past few months to be invited to train with the team. Samuel will be representing FCTC in the 8/U Team Summer league this year. Congratulations to Finley who has been invited to train in the Buckinghamshire's 8/U County training sessions. Finley is the first player Farnham Common Tennis Club has had partake in county training for a number of years. Finley attends group lessons weekly as well as a private lesson. He attends the clubs holiday camps and has entered match plays and competitions over the past few years. Finely was part of Farmham Common Tennis Clubs 8/U team who won the Summer Aegon Bucks League in 2017. We wish Finley all the best in his County training sessions in 2018. The annual Bucks and Milton Keynes Awards in 2017 awarded Stephen Wright with a highly commended in the Community Coach of the Year Awards. Coaching at Chalfont St. Peter Tennis Club is continuing to expand. Junior coaching numbers at the club have doubled over the Summer months and the junior membership has almost trippled! We have brought in the services of a new LTA level 2 coach, Tom Packman (pictured right), to assist with keeping up with demand at the club. The increase in members is partly down to the club re-surfacing 3 of its macadam courts in 2016 to a new tiger turf surface. This October 2017 the club is re-surfacing its 4th court to tiger turf as well. Chalfont St. Peter Tennis Club has a vibrant social programme on and off the court, the coaching programme runs throughout the year and includes term time coaching, holiday coaching as well as regular competitions. Birthday parties can be arranged as well! ​New coache Paul Saunders to join ITC's team for the 2017 Summer season in South Buckinghamshire. Paul has a wealth of experience and is a highly qualified LTA level 4 coach. Participation rates in Farnham Common, Stoke Poges and Chalfont St. Peter Tennis Clubs coaching programmes are growing and therefore we have appointed two licensed coaches to help us meet demand over the Summer season. For the coaches profiles and pictures please go to the coaches page of the website. Stephen Wright was nominated as Community Coach of the Year in the prestigious Bucks and MK Awards Nights at the Waterside Theatre. Sir Steven Redgrave also received an award at this event and is now in the Bucks and MK awards Hall of Fame. Stephen was nominated due to the fact he has recently passed a BSc degree in Professional Practice in Tennis Coaching Management, is undertaking his LTA level 5 Master Club Coach course, has set up satellite outreach clubs at local schools in Buckinghamshire and is running Sportivate sessions at secondary schools in South Buckinghamshire which has resulted in increased participation in the area. ​ITC Ltd was awarded the 'Provider of the Year Award' for increasing participation rates at schools linked with Farnham Common Tennis Club. Over 100 participants took part in the coaching sessions which took place at Burnham Grammar, Beaconsfield High School and Chalfont Community College over the Summer of 2016. The participants that took part were given the opportunity to attend free 6 week courses at the abovementioned schools. Players who took part in the sessions were invited to attend sessions at Farnham Common Tennis Club. On the right hand side is a picture of Head Coach, Stephen Wright with the award which was presented to him through the county sports partnership, LEAP. Stephen Wright has been asked to be an ambassador for the 2017 Kids For Free (formerly The Davis Cup Legacy Project) initiative. On Monday 24th October the Tennis For Kids 2017 application process will go live! Next year we want 20,000 new children to attend a TFK course. That's pretty huge! We'd love all coaches based in the U.K to be involved. Please help spread the word to encourage new coaches to sign up. 2016 coaches will be fast tracked through the application process but new coaches will need to submit a video or written statement. Start to talk to your venue/s about the programme to make sure they're on board. Keep an eye out for more info and link to signing up next week. Bigger and better in 2017Tennis For Kids is back, bigger and better than before. British Tennis’ aim is to get 20,000 kids, brand new to tennis, on a 6 week free tennis course next summer. Tennis For Kids launched in 2016 offering 10,000 children, aged 5-8, the opportunity to fall in love with tennis, on a course delivered by specially trained, fun and passionate coaches. The initiative was a great success reaching 13,000 kids and all of them took a brand new specially designed Davis Cup tennis racket home. Next year the courses will be open to kids brand new to tennis, and will be run between April and September. Further information on how to book and where the courses take place will be available early next year on this page and @BritishTennis.